This week’s CQM is the last forecast for 2019Q1 GDP whose official Advance figure will be released on April 26. CQM forecasts real GDP in 2019Q1 to be 3.2% on the expenditure side and 2.8% on the income side. PCA forecasts the real GDP growth rate in 2019Q1 to be 3.0%, which is equal to the average growth rate of real GDP on both the expenditure and income sides. 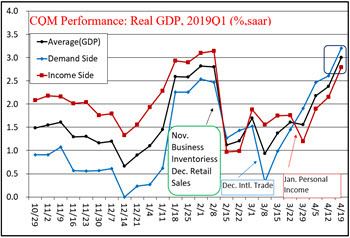 It is important for real GDP forecasts in 2019Q1 that all forecasts have recently been creating upward trends. February exports/imports and March retail sales revised the real GDP forecast from a moderate growth of 2.5% to a solid growth rate of 3.0%. 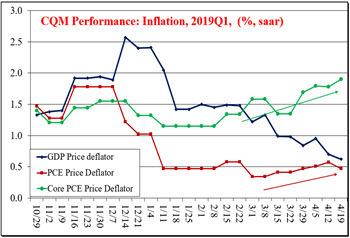 Another important takeaway from the CQM forecast is that inflation in 2019Q1 was below the Fed’s 2% target, but inflation, core inflation particularly, has been steadily increasing. Based on the economic condition in 2019Q1, Fed economists may increase interest rates this year. Our views and forecasts in CQM reports are just information for client. We are not responsible for any investment decisions made by clients.